Frank Agin, founder and president of AmSpirit Business Connections and host of Networking Rx, interviews Antti Leijala, author and entrepreneur based in Finland who provides "ultra lean" business consulting to small and micro businesses worldwide (www.ultraleanbusiness.com). For more information on AmSpirit Business Connections and its franchise opportunity program, contact Frank Agin at frankagin@amspirit.com or visit http://www.amspirit.com/franchise.php. No doubt, circumstances push people out of our lives. In this episode, Frank Agin, founder and president of AmSpirit Business Connections and host of Networking Rx, maintains that these people are still within our network and that there is social capital to reclaim. For more information on AmSpirit Business Connections and its franchise opportunity program, contact Frank Agin at frankagin@amspirit.com or visit http://www.amspirit.com/franchise.php. It’s no secret as to why you network: You want to generate benefits from your personal and professional life. In this episode Frank Agin, president of AmSpirit Business Connections, makes a simple case for the notion that to get these benefits, you need to offer them first. In so doing, Frank offers insights and ideas for executing this “give first” strategy. For more information on AmSpirit Business Connections and its franchise opportunity program, contact Frank Agin at frankagin@amspirit.com. For many, the hardest part of networking is getting started. In this episode Frank Agin, founder and president of AmSpirit Business Connections and host of Networking Rx, uses an analogy that’s intended to inspire you and some tactical strategies to get you consistently jumping into networking. For more information on AmSpirit Business Connections and its franchise opportunity program, contact Frank Agin at frankagin@amspirit.com or visit http://www.amspirit.com/franchise.php. It stands to reason that the first step toward improving anything is to start with a baseline measure. In this episode Frank Agin, president of AmSpirit Business Connections , makes a compelling case for applying this same logic to networking and offers a simple strategy for making a baseline measure of your network. For more information on AmSpirit Business Connections and its franchise opportunity program, contact Frank Agin at frankagin@amspirit.com or visit http://www.amspirit.com/franchise.php. All things being equal, people generally associate and do business with those that they know, like and trust. In this episode Frank Agin, founder and president of AmSpirit Business Connections, takes a deeper dive into what each of these three critical elements involves and how you can better capitalize on each. For more information on AmSpirit Business Connections and its franchise opportunity program, contact Frank Agin at frankagin@amspirit.com or visit http://www.amspirit.com/franchise.php. Networking is a skill. As such, you can improve it through practice and by becoming a student of it. In this episode, however, Frank Agin, founder and president of AmSpirit Business Connections, shares how you can improve your networking skills by learning from the high achieving networkers around you. For more information on AmSpirit Business Connections and its franchise opportunity program, contact Frank Agin at frankagin@amspirit.com or visit http://www.amspirit.com/franchise.php. It’s only basic human nature but others are attracted to us based on their perception of our potential value to them. In this episode Frank Agin, founder and president of AmSpirit Business Connections and host of Networking Rx, shares thoughts and ideas on ramping up your networking by creating value for others. For more information on AmSpirit Business Connections and its franchise opportunity program, contact Frank Agin at frankagin@amspirit.com or visit http://www.amspirit.com/franchise.php. In this episode Frank Agin, founder and president of AmSpirit Business Connections, shares a simple premise: “Whether you believe networking works or believe it doesn’t, you’re going to be right.” So, if you are looking to achieve greater success through networking, the first (and most simple) step is to believe that it works. 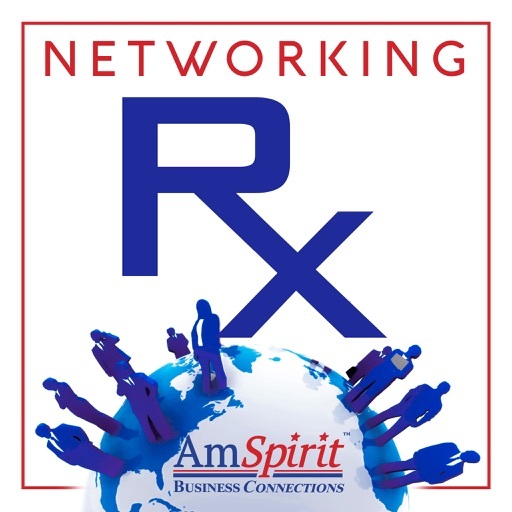 For more information on AmSpirit Business Connections and its franchise opportunity program, contact Frank Agin at frankagin@amspirit.com. Let’s face it. Networking gets a bad rap, often characterized as an unsavory tactic of desperate sales people. In this episode Frank Agin, shares a simple definition of networking and an expansive view of what it really is and all that it could be to contribute to your greater success. For more information on Frank Agin or AmSpirit Business Connections and its franchise opportunity program, contact Frank Agin at frankagin@amspirit.com or visit http://www.amspirit.com/franchise.php. © 2019 OwlTail All rights reserved. OwlTail only owns the podcast episode rankings. Copyright of underlying podcast content is owned by the publisher, not OwlTail. Audio is streamed directly from Unknown servers. Downloads goes directly to publisher.